On my first NCAA Cross Country Championships, I did not meet my expectation with a finish in 149th position. At NCAA Nationals, the best 31 Division I University teams plus 36 Individual-Athletes compete to crown their champions. 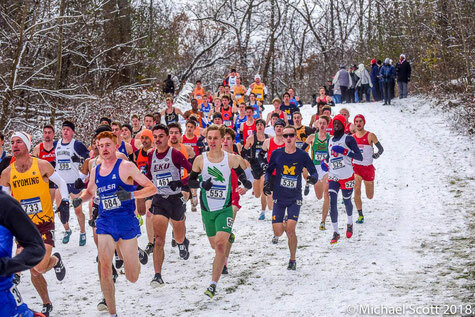 Following that, there are 255 of the best student-athletes racing each other, which makes this meet one of the most competitive and largest cross country races in the world. From box 16, I started decent in the race, but everyone else started as well as I did or even faster. First, I tried to follow the impressive pace but was a little bit too cautious, thinking about the 9500m to come. Following that, I passed the 2k-Marker in 183rd position, far off of my intended top 100 place. In the following miles I was able to move up in the field but not quite as well as I was hoping to. I finished the race in a disappointing 149th place. At the end, it was definitely an awesome experience, the dimensions and competition was much bigger than I am used to and I will learn out of my mistakes in the racing strategy which will defnitely help me in future championships.